December | 2012 | 50 Westerns From The 50s. Spending some quality time with my One-Eyed Jacks book this morning, thanks to my understanding, encouraging family and a fabulous crew of commenters (you know who you are) who help keep this blog chugging along, even when I ignore it for a day or two. Thanks to you all. Hope you all have a nice, fun, safe New Year’s Eve. You can bet that when I start resolution-ing tonight, many of them will involve writing about cowboy movies. * A reference to the tell-all book of the same name by Anna Brando (Marlon’s wife/ex-wife during the production of One-Eyed Jacks). It’s value as a source for my book is pretty questionable. My fingers don’t want to type this, as if that would make it not so. Harry Carey, Jr. has passed away at 91. Above, he stands between Ben Johnson and Ward Bond in John Ford’s Wagon Master (1950). It’s one of the best Westerns of the 50s, and Carey’s easygoing performance is one of its considerable charms. So many pictures benefited from his presence: Red River (1948), Three Godfathers (1948), Rio Grande (1950), Silver Lode (1954) and The Searchers (1956), to name just a few. He was the son of silent cowboy star Harry Carey and a member of John Ford’s stock company (his nickname was Dobe). His autobiography Company Of Heroes is one of the finest books on Western filmmaking you’ll ever read. As far back as I can remember watching movies, I’ve been aware of Harry Carey, Jr. So forget about this stupid blog. Go watch Wagon Master. Your 50s Westerns Want List. Don’t know if you’ve been naughty or nice, but one thing is certain: you people sure know your cowboy movies. Going through your responses for this year’s Want List, I was reminded of several films I’d forgotten. Thanks to everyone who played along. The titles have been grouped by studio, according to their original release — independent productions such as The Hired Gun (1957) are with their distributor (MGM in this case). I’ve indicated the widescreen films (off the top of my head, not researched — sorry, it was really late). Merry Christmas From 50 Westerns From The 50s (And These Folks). Not sure who Doreen and Jack are (our guess is Jack Hawkins and his wife), but I bet they were thrilled to receive this during the holidays of 1958. 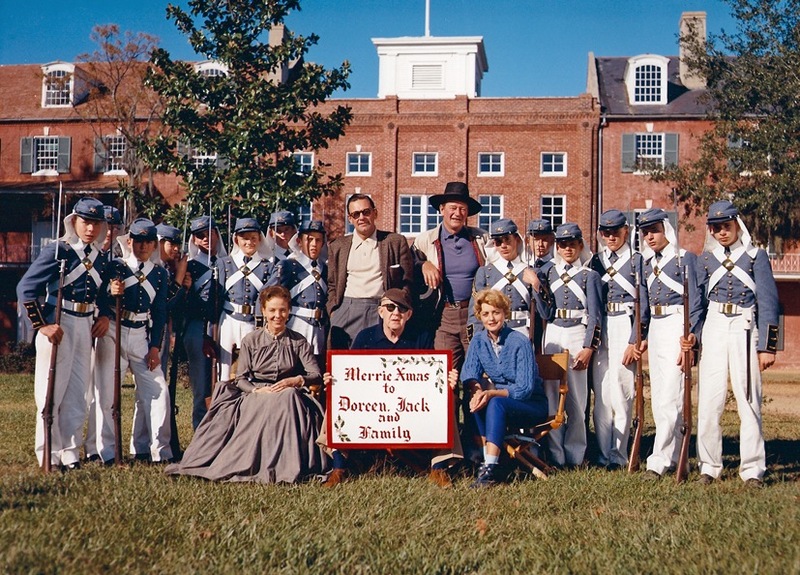 Taken on location for John Ford’s The Horse Soldiers (1958). Has John Wayne ever looked cooler than he does here? Fact is, everybody looks terrific, from the beautiful Constance Towers to Ford himself. Here’s hoping your holidays are safe, fun and filled with whatever it is you want them filled with (cowboy movies, maybe?). The 3:10 To Yuma (1957) Pulls Into The Library Of Congress. Blake Lucas pointed this out, and it’s certainly worth highlighting here — 3:10 To Yuma (1957) has been added to the National Film Registry by the Library Of Congress. It’s the seventh 50s Western to make the Registry, the others being High Noon (1952), Shane (1953), The Naked Spur (1953), Johnny Guitar (1954), The Searchers (1956) and The Tall T (1957). While you can maybe argue the titles (I would’ve gone with Winchester ’73), you certainly can’t complain about the directors they’ve chosen to honor. So when’s Rio Bravo (1959) gonna get in there? 50s Westerns Wish List For 2013. We did a 50s Westerns Want List a couple years ago and it was a blast — and a surprising number of our wishes have since come true! So it seems about time to do another one. Last time around, I polled a few people offline, but I’ve since learned that a lot of the fun comes from watching y’all feed off each other as you load up the comments box. So send in your lists. I’ll compile and sort the responses — then see if I can get them to someone who can actually do something about it. I’ll start. Reprisal! (1956) and The Hard Man (1957), both from George Sherman and starring Guy Madison, and Fred MacMurray and James Coburn in Face Of A Fugitive (1959) — all from Columbia. Then there’s a Blu-ray John Sturges/Kirk Douglas/VistaVision twin-bill of Gunfight At The O.K. Corral (1957) and Last Train From Gun Hill (1959). I could go on and on. UPDATE: I’m compiling and sorting all your requests and will post them Christmas day. 50s Westerns 2012 DVD/Blu-ray Wrap-Up. One of the biggest topics of discussion, or debate, here at 50 Westerns From The 50s is what’s coming out on DVD and Blu-ray. What’s on the way? Will it be widescreen? Will there be a Blu-ray? Can I get rid of the subtitles? I thought it might be fun to look back at the 50s Westerns releases of 2012. There were some good ones. Use the comment thing to “nominate” your favorite 50s Westerns DVDs and Blu-rays. 1. 50s Western you were the most excited to see released. 2. Best 50s Western DVD or Blu-ray of 2012. Best doesn’t necessary mean the quality of the film itself, but its video presentation. Limit your picks to titles actually released to DVD or Blu-ray during the calendar year 2012. MOD titles from Warner Archive or the other programs are eligible. I’m curious to see what you all liked. If there are a lot of responses, a later survey/vote might be in order.